Chinese hawthorn growing tree of the genus Crataegus also known as Crataegus pinnatifida, Chinese hawthorn perennial deciduous plant, fruit edible also used as ornamental plant and as bonsai, can grow in temperate, mediterranean, subtropical climate and growing in hardiness zone 5-10. Leaves color green lobed to deeply lobed with serrated edge. Flower color is white in the inner part is yellow and the stamens are red, the flowers grow on clusters. 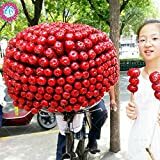 Fruit edible, peel color red can be with white dots the inner part of the fruit is white, the shape of the fruit looks like little apple with crown in the top. Is it necessary to graft in Chinese hawthorn? White flower with yellow inner the stamens are red, the flowers grow on clusters. What can be done with big quantities of Chinese hawthorn fruits?